These big heart pillows are filled with love and are the ultimate way to express your emotions. From romantic heart-shaped personalised cushions to unique gifts for Mother's Day and beyond, they're sure to put a smile on someone's face. Your photos are printed onto suede fabric, hand sewn and filled with soft polyester beads. Made using a soft, suede feel fabric that's custom printed with your photos, the big heart pillow brings your feelings of love to life. Your designs are directly printed to the top of the heart and the sides and back are a deep, rich red colour for added drama. It's filled with super-soft, polyester beads, and has a concealed zip with heart pendant so you can remove it for washing. Any special occasion can be celebrated with bespoke photo heart cushions, and they make a sentimental keepsake as well as a decorative home furnishing. I did order for big heart cousin for my friend and she liked it. I received excellent customer service and very clear communications from your online chat team and especially a contact named 'Shin'. Thank you for the great support as the present was for my wife's 50th! Expertly handmade to order in London, UK, our seamstresses ensure your heart cushion is a beautiful gift worthy of your recipient. We take panels of suede vision fabric which are printed with your unique designs using a specialist process and then cut into heart shapes. The inks are printed deep into the fibres, so your designs won't peel away or scratch off. A discreet zipper is installed, finished with a stylish heart pendant, as you can never have too much love in your life. Filled to a comfortable, plump level with polyester beads and hand sewn together, your big heart pillow is totally one of a kind. The sides and back of the pillow are printed with a deep, rich, love red colour, so you could carry this theme on in your designs or choose something totally contrasting like a white-based picture. There's loads of space to customise, so another idea a photo collage, perfect for wedding anniversaries or moving home. Simply select several pictures you want to use and choose from a preset montage style or alternatively, move the photos manually to create your own arrangement. If you and your loved one are moving out for the first time together, commemorate this milestone with a big heart pillow. Placed on the bed or sofa, it's a lovely reminder of your relationship and it can be kept for years and years to come. You can also add the date to your new home pillow to make it extra special and unforgettable. This is one Valentine's Day gift that'll last a lifetime. Surprise your partner with a customised heart pillow, big in size to demonstrate how much love you have for them. 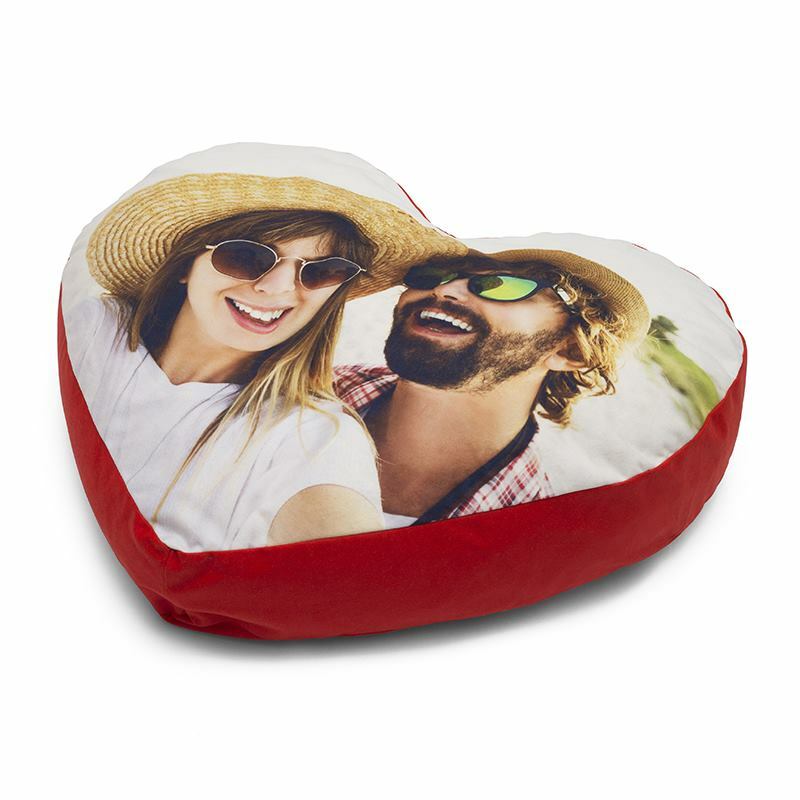 Your photo is permanently printed onto the surface of the Valentine's Day photo heart cushion, so it can be a symbol of your everlasting love. If a loved one has been poorly, don't just send them a bunch of flowers that won't last the week, send them a get well soon pillow. Design a special heart-shaped cushion, personalised with a positive message or nostalgic photograph. During their times of duress, they can look at their love cushion and smile, reminded by how thoughtful you are.